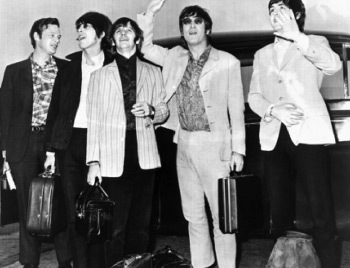 The moment the Beatles stepped from the plane onto American soil in 1964 they became an instant hit not only for the sound but also for the look and style they brought with them. Sharp suits, skinny ties and shaggy hair- the world had never seen anything like them before. Pre The Beatles, John Lennon, was a part Teddy Boy and art school student, with an indecisive style. Ringo Starr was a full-on Teddy Boy in order to fit into the working class Liverpool neighborhood. George Harrison was the most image conscious of the group, making adjustments to his school uniform by adding in bright colours and statement trousers. Paul Mccartney followed the crowd with style and conformed in a way to not stand out. Mccartney was perhaps the biggest influence on the groups overall style when on a trip to a Butlins holiday camp he saw a group of five men dressed alike. Mccartneys early sighting inspired the group to wear clothes which represented them as a team together. During the bands biggest British tour, they had worn matching stage outfits with each Beatle wearing the same suit. These were not the regular suit but instead had no lapels or collar, made from a silver-gray with black edging and were based on a suit seen on the catwalks in Paris by Pierre Cardin. This silver suit became something of a Beatle recognised uniform. Though the band started out with a generic style consisting of leather jackets and greaser hair they quickly embraced reinvention. The groups look quickly developed along with their sound, taking influence from other bands around them and the things they were experiencing on their journey. 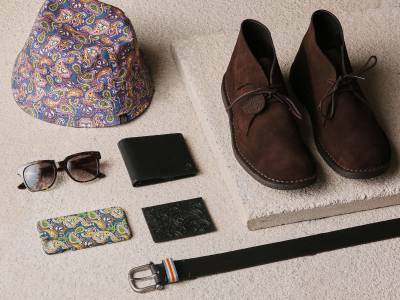 The dark suits gave way to the mod look and then the growth of bright colours, floral and paisley patterns. The band not only sold records but also started trends as millions of followers began to copy their style from everything to their Cuban-heeled boots to John Lennons signature glasses. The Beatles style was something which, combined with the music, propelled them into becoming the worldwide phenomenon they are regarded as. The Mop-top gets its name because of its resemblance to a wet mop. The hairstyle was first introduced when The Beatles went to America in 1964 and soon went on to be a major trend with sales of Beatles wigs in high demand. The Lennon glasses are perhaps the most iconic piece when remembering John Lennon or the Beatles. The glasses were given to Lennon in preparation for his role in Richard Lester’s film How I Won The War along with an army style hair cut. Unlike the hair cut, the glasses remained a mainstay item for Lennons style. During the Beatles first tour in 1964, John Lennon wore a black fishermans cap which quickly became popularly known as the ‘Lennon Hat.’ It is said that Lennon wore this hat as a way to become noticed by the press and to set him apart as the leader of the group. The cover of the 1967 Sgt. Pepper album was the definition of the psychedelic movement of the time. 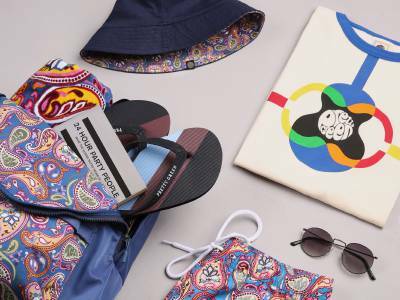 The Beatles headed this style wearing paisley scarves, floral shirts, velvet jackets and acid bright colours.